Hello there! PetED activities have been crazy busy this year. Unfortunately, that has curtailed my ability to send out cool cases like this for you as regularly as I had been. Good news! I’ve missed you and I am back! Yesterday, while working clinically, I had the opportunity to help with a 7 year old Bishon Frise’. She was admitted for a COHAT (comprehensive oral health assessment and treatment). Her last dentistry revealed some localized areas of periodontal disease. 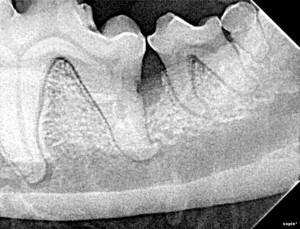 Here is an intraoral radiograph of 309 (left lower first molar) from December, 2012. This radiograph revealed vertical bone loss distal to the caudal root. We were also concerned about the resorptive “notch” in the root. This client did not want to see a specialist at this point. We root planed the lesion and provided careful subgingival curettage, then implanted Doxirobe ( a perioceutic antibiotic impregnated gel; Zoetis). Our recommendation was for her to attend one of our FREE client focused dental education seminars to learn how to train her pet to cooperate with daily tooth brushing and to return in 6 months for a reassessment under general anesthesia. She did attend the seminar and started the brushing routine. Although, she admits to not providing daily care, she does brush the teeth. She did not admit this dog for the next COHAT until yesterday. 16 months had passed instead of the recommended 6 months. 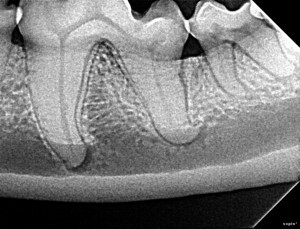 We were so happy to see the results of yesterday’s radiograph. The bone filled in nicely. We were able to show this owner what her efforts and expenses provided for this baby. There were two other areas from the previous dentistry where we root planed and provided periodontal therapy. Those areas showed similar healing and all periodontal pockets scores were normal. We were certainly motivated to take care of this tooth. That hook on the caudal root could pose a challenge for extraction. I hope this case shows the value of periodontal therapy, follow up assessments and client education. Maybe today, I will get another case to share with you. Today is the last day working clinically before I fly to Sierra Vista, Arizona to work with the staff of New Frontier Animal Medical Center. I will be providing training to take their existing dentistry skills to the next level and to meet their clients at their Client Connect Seminars!